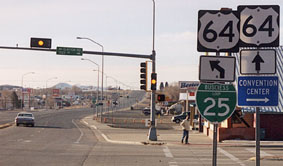 US 385 and US 64 joined in Capulin and came into Raton from the east, via what is now US 64-87 (Clayton Road), ending at today's Business 25 (2nd Street, which was US 85 back then). That intersection probably also marked the north end of US 485. Originally US 85 followed what is now US 64 southwest out of Raton, and then continued south to Maxwell via modern NM hwy. 445. That remote intersection is called "Hoxie Junction" (photos from there can be viewed on my main US 485 page), and where US 64 continues southwest could have been the north beginning of US 485. But it seems more likely that US 485 would have overlapped with US 85 about 15 miles north, terminating in Raton. The light in the middleground is 2nd -- the signs make it unclear whether Business 25 goes both ways or just to the left (the correct answer is both ways). 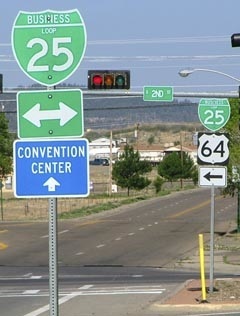 US 485 probably began to the left with US 85. As can be seen here and in the photos below, US 64 signs are still posted on surface streets in town. 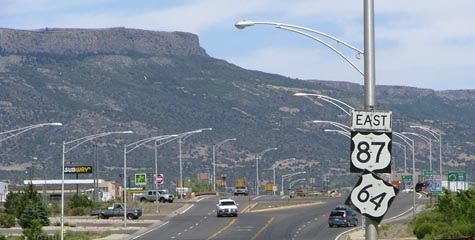 But as travelers approach Raton from either direction on US 64, signs direct traffic to use I-25 between exits 446 and 451. However, US 64 did follow 2nd and Clayton before I-25 was built, so probably these signs have simply been perpetuated since then. For one thing: while US 64 is an east/west route, US 87 is actually a north/south route. Also, that was the only US 87 sign west of I-25 in Raton: according to all other signage, southbound US 87 actually "begins" straight ahead at the I-25 interchange. To the north, there is a gap in US 87 -- it is not signed along I-25 in Colorado, so it does not pick up again until one crosses the Wyoming line.